User D had truncated a table by mistake on production environment. The DBA tried to recover table from RMAN backup, and accidently the backup is unavailable. Therefore DBA decided to use PRM-DUL for rescuing all truncated data. Attention: if your data file was generated on AIX, if you want to recover data on window, please select original Big Endian format. Usually, if the database is not too big, we could select all data files together; if the database capacity is huge and DBA knows the data location, at least you should select both SYSTEM tablespace and specified datafile. Specify the Block Size (Oracle data block size) according to the real circumstance. For example, if default DB_BLOCK_SIZE is 8K, but part of tablespaces’ block size is 16k,then user has to specify them as correct block size one by one. OFFSET setting are just for raw device storage mode, for example: on AIX, based on LV of normal VG, the offset will be 4k OFFSET. PRM-DUL read Oracle dictionary directly, and recreate a new dictionary in embedded database. It can help us to recuse most types of data in Oracle DB. 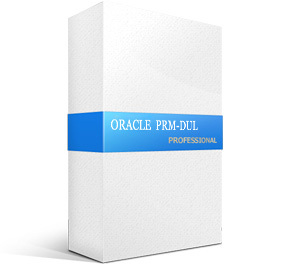 Attention: PRM-DUL supports multiple languages and multiple Oracle character set. However, the prerequisite is the OS had installed specified language packages. For example, on Windows, if you didn’t install Chinese language package, even Oracle database characters are independent and support ZHS16GBK, PRM-DUL would display Chinese as messy code. Once the Chinese language package is installed on OS, PRM-DUL can display multibyte character set properly. Similarly, on Linux, it need font-Chinese language package. After loading, in PRM-DUL GUI, it displayed database tree diagram by database users. PRM-DUL will scan the tablespace and extract data from truncated table. As in the above picture, the truncated TORDERDETAIL_HIS had exported 984359 record, and saved to specified falt file. When you import data to original table, ParnassusData strongly recommends you to modify SQLLDR table name as a temp table, it would not impact your previous environment. After diffing, there is no difference between original data and PRM-DUL exported data. In Case 1, we use traditional unload+sqlldr for data recovery, but actually ParnassusData would like to strongly recommend using DataBridge Feature for recovering. Traditional unload+sqlldr means a copy of data needs to be saved as flat file on filesystem first, data has to be loaded into Unicode text file and then inserted into destination database by sqlldr, this will take double storage and double time. DataBridge can extract data from source DB and export to destination DB without any intermediary. Once the data arrived destination DB, user can begin to validate them. If source and destination database located on different servers, then read/write IO will be balanced on two servers , MTTR will be saved. If DataBridge is used in truncated table recovery, it is very convenient that truncated data can be exported back to problem database directly. As the first time to use DataBridge, DB connection information is necessary, which is similar with SQL Developer connection, including: DB host, Port, Service_Name and Account information. Attention: DataBridge will save data to the specified schema given in the DB connection. After inputting the account/connection information, you can use test for connection testing. If return message is “ Connect to DB server successfully “, the connection is done and click to save. After saving connection and go to DataBridge window, please select Connection G10R25 at the drop down list. If your DB connection is not in the drop down list, please click DB connection Button, which is highlighted in red. Attention on DataBridge recovering truncated/dropped table: when you recovering truncated/dropped and insert data back to source DB, users should choose another tablespace which diffs from the original tablespace. If export data into same tablespace, oracle will reuse space which stores truncated/dropped table, and can make data overwritten, we will lose the last resort to recover the data. Attention: 1) For destination DB which already had the same table name, PRM-DUL will not recreate a table but append all recovered data. 2) For destination DB which did not have source table name, PRM-DUL would try to create table and recover the data. In this case, we would recover Truncated data, therefore, please select “if data truncated?” checkbox, Or, PRM-DUL would do regular data extraction, but not Truncated data. Truncate recovery methodology is: Oracle will only update table DATA_OBJECT_ID in data dictionary and segment header. Therefore, the real data will not be overwritten. Due to the difference between dictionary and DATA_OBJECT_ID, Oracle server process will not read truncated data while scanning table. But, the real data is still there. PRM-DUL will try to scan 10M-bytes blocks which are behind of the table’s segment header, if some blocks with smaller DATA_OBJECT_ID than the object’s current DATA_OBJECT_ID, then PRM-DUL thinks it find something useful. There is a blank input field called ”if to specify data object id”, which let user input Data Object ID. Usually, you don’t need to input any value, unless the recovery does not work. We suggest user to contact ParnassusData for help. Click DataBridge button ,then it will start extracting if the configuration is done. DataBridge will display the successfully rescued rows and elapsed time.